We had a real pleasant day and got home just as Bridget had supper ready. I was very tired and went to bed early in the evening. 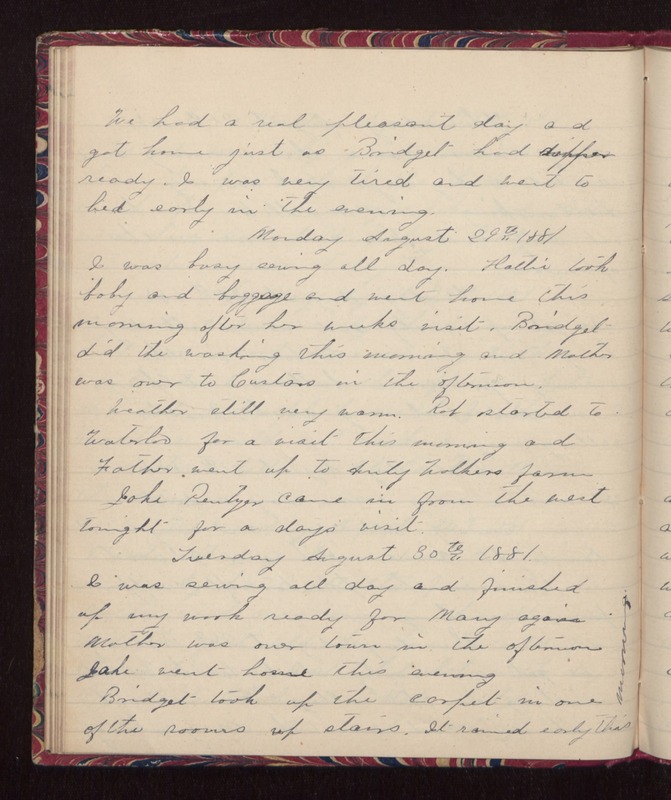 Monday August 29th 1881 I was busy sewing all day. Hattie took baby and baggage and went home this morning after her weeks visit. Bridget did the washing this morning and Mother was over to Custors in the afternoon. Weather still very warm. Rob started to Waterloo for a visit this morning and Father went up to Aunty Walkers farm. Jake Pentzer came in from the west tonight for a days visit. Tuesday August 30th 1881. I was sewing all day and finished up my work ready for Mary again. Mother was over town in the afternoon. Jake went home this evening. Bridget took up the carpet in one of the rooms up stairs. It rained early this morning.